Basement windows are precious, so you don’t want the view marred by corroded, weedy, debris-filled window wells. Our SunHouse™ window wells ensure a bright, clean vista. Unlike steel window wells, SunHouse™ window wells will never rust, rot or deteriorate. 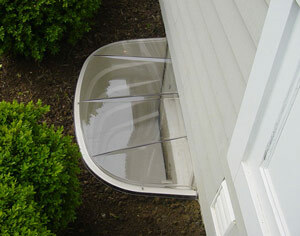 SunHouse™ window wells never require painting and are easy to clean. White finish maximizes the transmission of natural light through the basement window. A clear plastic cover ensures that the well will never fill with rainwater, leaves or other debris. This eliminates leaks while also keeping the unit clean. The high-quality appearance of SunHouse™ window wells brings the beauty of a basement remodel to the exterior of your house. 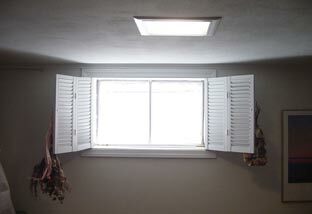 Total Basement Finishing specializes in installing these window wells for the benefit of your basement. Contact your local TBF dealer to schedule a free estimate! 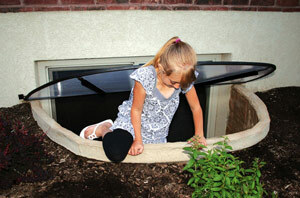 Clear window well covers keep dirt and debris out, while improving energy efficiency. What do you expect from a basement window? Do you look out your window and see ugly, rusted steel from your window enclosures? Are you looking at weeds or a dark pit filled with leaves and debris? Is mud splashed all over the outside window glass and frame of your basement window? Do your basement windows leak into your newly finished basement? The purpose of basement windows is to make your basement a brighter, more friendly environment. 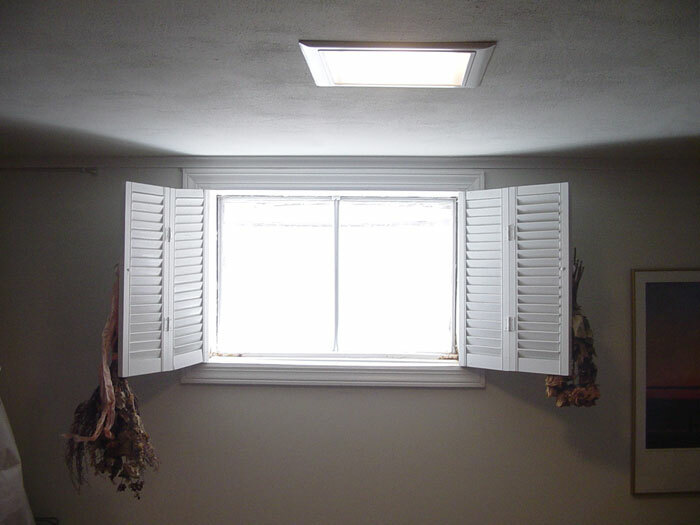 If you look out your basement window and don't like what you see, and your basement windows are not letting light in, then they're not doing their job. Egress window wells with steps facilitate exiting from the basement during an emergency. On the other hand, how can your basement windows be the problem if they're covered in mud or surrounded by weeds, leaves, and an rusty, ugly window enclosure? They need protection! The SunHouse™ Basement Window Enclosure is the answer. Bright, cheery, and clean, the heavy duty SunHouse™ Window Enclosures protect your basement windows, keeping away weeds and other debris. Make the most out of your basement windows! One of the most significant differences between your basement and your other living space is the presence of natural light. Our SunHouse™ Window Wells have specially shaped sides, colors and sloped bottoms that reflect as much light as possible through your basement windows. This makes your basement a brighter, more pleasant place. And with your new TBF Finished Basement System, you'll want more light to show off your new basement! Protect your newly remodeled basement! 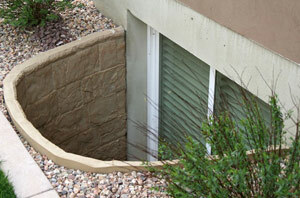 A molded-in, stone texture gives egress window wells a more natural look. If your basement windows are leaking because water is pooling outside or is being trapped by your previous basement window enclosures, the SunHouse™'s matching sturdy, clear cover (included with each SunHouse™) will solve your problem. It can keep rainwater, melting snow, and water from leaking in and damaging your remodeled basement. Additionally, it will make your basement more energy-efficient by shielding your basement window from cold winds, blowing outside. Like all Total Basement Finishing basement remodeling products, the SunHouse™ is made to last. Set in a bed of washed stone for drainage, it will never rust, rot, or corrode. The cover ensures that your window wells will never fill with rainwater and that your basement windows are kept clean, while increasing the life of your basement windows dramatically. The SunHouse™ is a perfect combination for the EverLast™ Basement Windows for a great, new look and increased energy-efficiency in your finished basement! 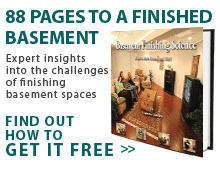 Sign up for a FREE basement finishing estimate today.